The fast fashion business model is wasteful and hurting the environment. It's time to get changed. 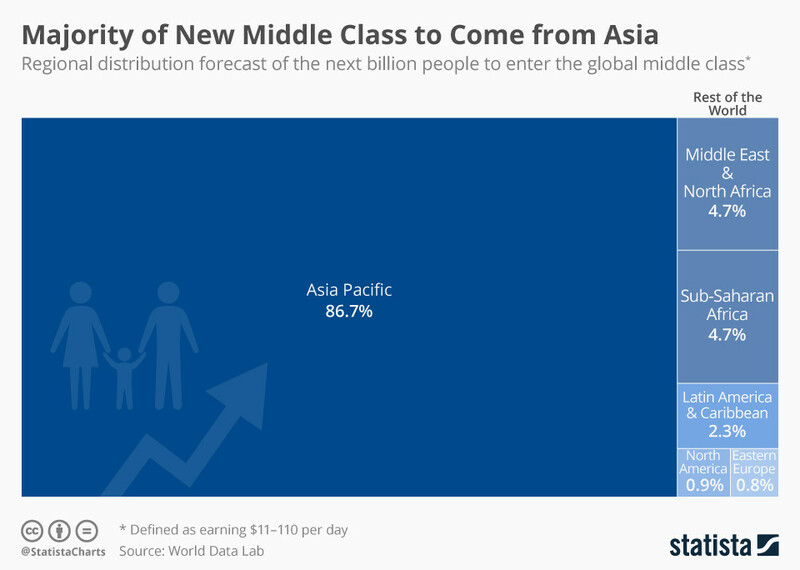 Nearly half the world’s population now lives in households with enough discretionary income to be considered ’middle class’. Driven largely by an explosion in this section of society in India and China - now spreading to Southeast Asia - this trend has perhaps gone unnoticed by some. But what hasn’t gone unnoticed is the net result of this titanic shift in the way in which billions of people now live their lives. Supermarkets are shrines to choice. Our aisles are filled with countless types of bread, meat and produce – and that’s just what we eat. The digital revolution has also enhanced and entrenched the availability of multiple options. Where TV networks, film studios and record companies once held sway, my generation consumes digital content via unlimited choices provided by subscription-based providers such as Netflix and Spotify, not to mention a range of free-to-use online music streaming platforms. But an important question to ask is whether this abundance of choice generates additional utility in our lives. At a more human level, does having ready access to more options make us any happier? The modern phenomenon of fast fashion came about due to our desire to have the latest fashions quicker and at a lower price. This led to compressed timelines for producers and transporters, as well as retailers. Clothes are mass-produced at breakneck speed, then shipped to retailers who have a limited window in which to sell them before the next shipment arrives. The result? Tonnes and tonnes of unsold clothes. According to the Ellen McArthur Foundation, one garbage truck of textiles (about 12 to 14 tonnes) is wasted every second. In July 2018, the fashion brand Burberry faced global outrage when it was revealed they burned almost $40 million-worth of unsold clothing as well as other luxury items in a bid to prevent unwanted stock from being sold at lower prices. Unsold clothes are just the tip of the iceberg. 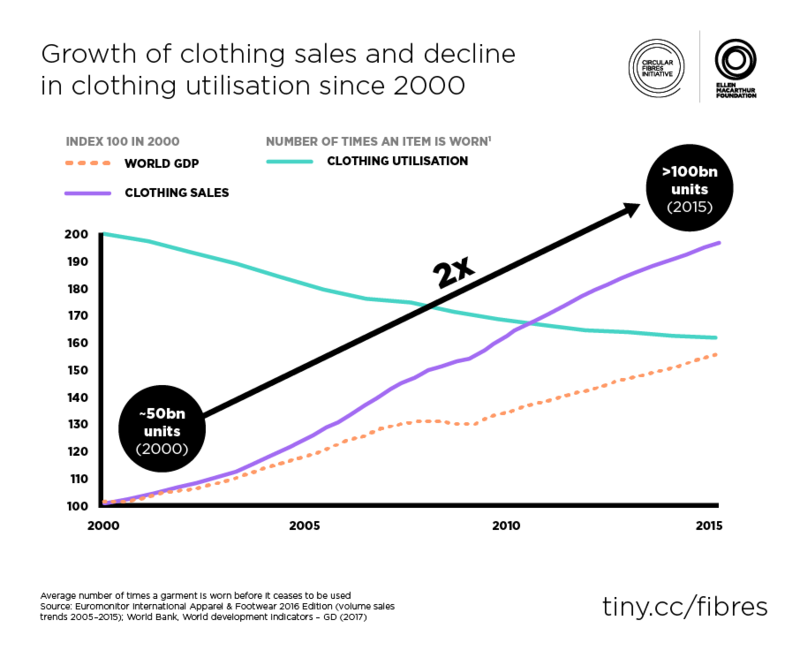 Even as production volumes have increased, clothing utilization – the number of times clothes are worn before they are discarded - is decreasing. While the global average in 2016 was around 120 uses per clothing item (down from 200 uses in 2002), China has seen a dramatic drop to 62 uses, while the US has always had an average of 40 uses. The reality is that discarded clothes wouldn’t be such a problem if the industry had an established infrastructure for recycling old clothes. It is estimated that only 13% of the total material input for producing new clothes comes from recycled post-use materials. Lastly, the clothing production process itself is often seen as resource-intensive, wasteful and waste-generating. According to the report cited above, if nothing changes, industry carbon emissions will continue to rise and will take up more than a quarter of the carbon budget for a 2˚C scenario. According to the Pulse of the Fashion Industry report - published in 2017 by the Global Fashion Agenda and the Boston Consulting Group - sourcing from more renewable sources, implementing innovation in the manufacturing processes, and addressing various social issues such as labour practices in their supply chains could generate $192 billion for the global economy in 2030. The opportunity is enormous. But solving the problem won’t be easy. There are both practical and emotive factors at play in any attempt to change behaviour. With billions of people in developing economies stepping into the middle class for the first time, fully intending to purchase both what they need and what they desire, we are unlikely to change consumer behaviour on the scale and at the pace that are required. The industry also employs around 300 million people across the value chain. Any proposed solution must take into account the need and right of people to develop and improve their lives and to be part of global transactions. What, then, are pathways available for us to solve the problem? First, we need to solve the issue from the supply side of fashion. More than 63% of existing textile fibre supply chains are accounted for by synthetics like polyester and acrylic. While they are cheaper than organic materials, synthetics are fossil-based, non-biodegradable and are challenging to recycle. A synthetic-heavy industry will also generate plastic microfibres that find their ways into our oceans. We need to move instead towards circular, biodegradable and natural fibres - responsibly produced and sourced. As producers of viscose rayon, Sateri and Asia Pacific Rayon (APR) manufacture a product made from 100% wood cellulose. Our goal is to offer biodegradable and natural fibre at a scale that can steadily wean us from fossil-based synthetics. Consisting of natural plant-based polymers, viscose rayon is biodegradable and decomposes naturally. Viscose rayon is also sourced from sustainably managed tree plantations - a renewable resource, harvested usually in a cycle of five to seven years. The production process also uses less water than cotton. Second, we need to find a way to make the industry more circular as well as encourage consumers to replace today’s throwaway culture with one that values recycling and long-term use. Supply chains need to be incentivized to produce purer blends of garments to enable ease of recycling - which means the construction and deconstruction of garments must be embedded in the design process, not an afterthought. Third, we must not make the same mistake as other industries in which manufacturers down-cycle products. In the future, clothing produced from recycled fibre must not be seen as inferior by consumers, to be sold therefore at a reduced price. In order for recycled textile fibre to grow at scale, we must tip the momentum by encouraging up-cycling. In this scenario, market forces would determine a premium for recycled textile fibre that makes its way into garments that we wear. I asked earlier – are we really more happy when we have ready access to more options? Fashion provides both utility and expression in our everyday lives. Understanding the choices we have within the natural fibre sector is indeed important, as each has its own strengths and weaknesses. But what we can no longer debate is that the time has come to transition to a textile system that can embrace and embed changes that deliver improved societal and environmental outcomes - for the betterment of both my generation and those to come. What happens when you toss your water bottle in the trash? 127 countries now regulate plastic bags. Why aren't we seeing less pollution?